Likoni is the site of the southern terminus of the Likoni Ferry, a double ended ferry serving road traffic and pedestrians from both Likoni and Mombasa Island. Likoni, is just outside of the city of Mombasa. School attendance in this region is out of reach for many, not just because of the attendance fees, but distance and family’s need for an income. These kids need education in whatever for they can get it. Since the governments are preoccupied with their own well-being, the children need someone else to look out for them. This poverty affects children and youth disproportionately, as it prevents them from finishing school and from finding work, leaving many idle, looking for ways to earn pennies while losing the opportunity to pursue their dreams. As a result Likoni stays poor and the ills of poverty, including idleness, crime, disease and early pregnancy, continue for another generation. The most important economic activities within this region are trading and fishing. However, the current individuals below poverty line in the area are still at 47%.The area lies within the coastal strip of the Indian Ocean and the people are basically traders and fishermen. On average, each household has 6 people living as squatters (have no land), since land forms the basic critical issue in the District. 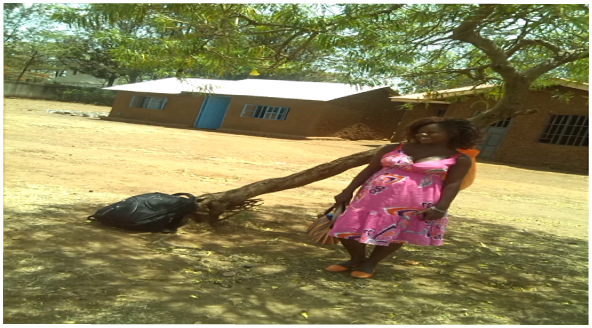 Education facilities within the Division are of very poor quality, and without any proper attention given to the destitute and the orphans. This discrimination of the vulnerable has resulted to high dropout rate from school, thus indulgence in immoral activities. Even in the existing schools there is a big challenge has been the lack of adequate learning facilities which is a menace to all government learning institutions to accommodate the rising number of pupils in school, a factor that has reduced the quality of education to the children. Within Likoni district access to wood fuel the main type of fuel in the area is a problem as there are no forests. Due to this Carbon Zero has implemented an energy efficient cook stove project which has enabled households to cut on their wood use and save some money to even buy food and pay school fees for children. Having a cook stove project within the area and having seen how the community suffers under high levels of poverty with the help of our partners Specialist Computer Centres (SCC) we chose to help fight the chronic poverty through enhancing education in the area; we chose Shikaadabu Primary School and started improving its facilities in consultation with the school management. So far we have managed to refurbish several classes, plastering dilapidated class floors, roofing the classes afresh and replacing old leaking iron sheets with quality new ones, making new desks for the pupils, painting dirty class walls to make them conducive for learning, construct a fence for the school and a gate for the school to curb rates of pupils sneaking in and out of school anyhow. Speaking to the school head teacher she says…. The house from my Wood Savings! For anyone who relies on an open fire to cook daily meals, the need for fuel rivals that for food itself. Staples from Ugali to Githeri are inedible without cooking, while other foods require heat to release their greatest nutritional value. Human life requires cooking, which means having access to fuel. Still, the three-stone fire is hellishly inefficient, transferring as little as 10 percent of the heat it produces to a pot and the food it holds. Fuel is wasted, as heat is allowed to escape into the open air. The open fire consumes a lot of fuel as (a) not much heat is generated per unit of fuel, (b) only a small proportion of the heat is actually directed to the pot and (c) only a small fraction of the heat that is directed to the pot is actually transferred into the food. This requires more labor on the part of the user to gather fuel and may result in increased deforestation if wood is used for fuel. 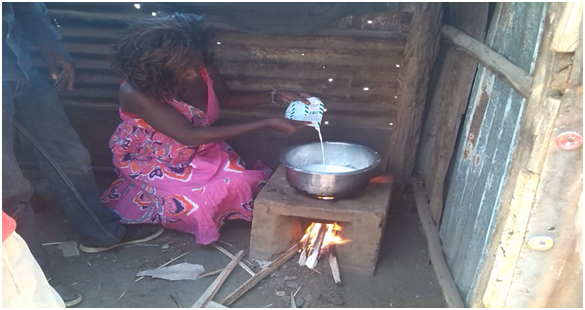 Catherine a Carbon Zero Stove beneficiary in Kisumu East has always been using the three stone cooker ever since she was born and had never seen an alternative cook stove. She says that previously she didn’t know how expensive it was sustaining a three stone stove. Knowing well that Kisumu East has fewer forests with most land under farming the only way to get firewood was and still is through buying. While using the three stone stove she says she used to buy wood worth 700/= Kenya shillings per week and this was too expensive for her. Currently Catherine says that since she received a Caborn Zero stove her life has changed so much. 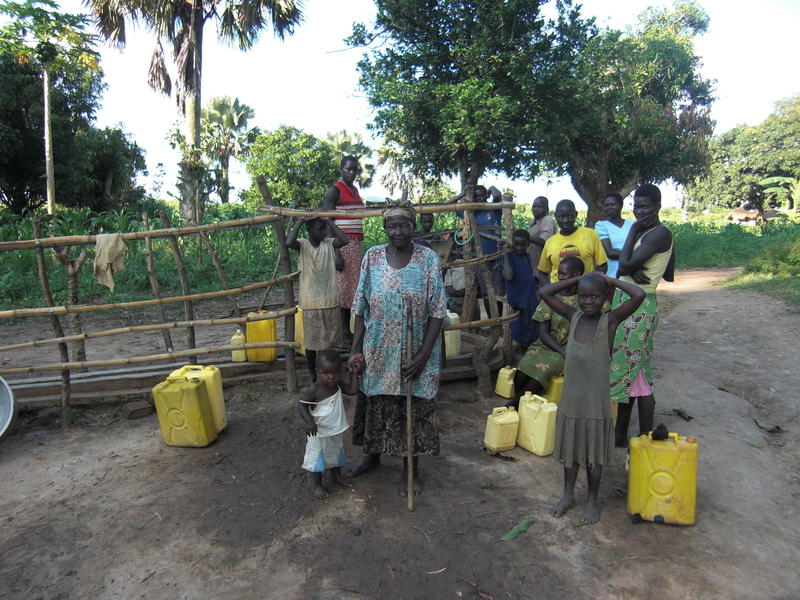 She says “ever since I received the CZK stove I have seen a big difference in my life. For instance the CZK stove saves wood fuel which enabled us channel some of the wood to another project of building a semi permanent house. The money we save through proper wood management and use has enabled us buy some building materials. Communities, Forests and Climate Change! Despite decreased deforestation rates in some regions, forest ecosystems are still under great threat. Changes in Earth’s forest cover impact cycles of water, energy, carbon, and other nutrients, as well as the ability of ecosystems to support biodiversity and human economies. Knowledge of these processes is critical to understand the rates, causes, and consequences of land use change and ultimately, to manage ecosystems sustainably. Restoring lost forests and degraded lands is essential for human livelihoods and well-being, long-term food security, climate stability, and biodiversity conservation. In order to counteract land degradation and to improve livelihoods, we need to restore forests and increase the productivity of existing agricultural land at the same time. Only then can we create carbon intensive landscapes that are also diverse, productive, and resilient. In Kenya the case has not been different and Carbon Zero Kenya has been in the front line campaigning for forest conservation by practically providing energy efficient cook stoves which have helped alleviate pressure on local forest among community members. 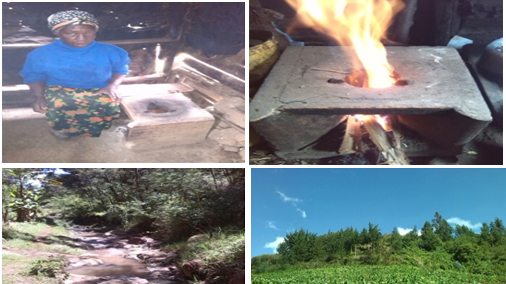 One main forest that mainly benefited a lot form Carbon Zero initiatives has been Kereta forest (Kikuyu escarpment forest) which was on the verge of depletion but since the distribution of the energy efficient carbon zero stoves and implementation of rigorous capacity building programs the forest has resurrected. Local area Administration within the Aberdares region in conjunction with Kenya Wild Life Service (KWS) have also complimented Carbon Zero in this course. We are now keen to note that the forest has been partially afforested and deforestation is minimal. Stakeholder Meetings in Dowa and Kasungu, Malawi! This week on Tuesday April 14th, Concern Universal, our partner for the borehole-rehabilitation project in Malawi has started the local stakeholder meetings in Dowa and Kasungu Districts . The overall objective of the meeting is to provide all the information about the project to the local communities. Concern Universal will also use this opportunity to collect some outstanding data and initiate some additional stakeholder feedback mechanisms. We thank Concern Universal Malawi for all their effort in organizing the meetings and we are looking forward to progressing with the project. It is everyone’s joy that as night creeps in and the last rays of the sun give in; there is a clean home to return to for rest. Young ones are seen running up and down playing the evening away as others are running after goats and sheep as they put them into their sheds. Women are seen carrying firewood to the mud and wooden huts ready to prepare the evening meals. The older men are in groups charting about one thing or another. But as darkness sets in, every woman will sit in front of a fire place to prepare a meal for her family – and this is where the problems start from. According to the World Health Organization (WHO), close to three billion people worldwide – nearly half the global population – rely on open fires and traditional stoves for cooking. These heating methods rely on biomass for fuel, which is notoriously inefficient, contributes to deforestation and climate change, and produces a large amount of smoke. This exposure to smoke has come with significant health consequences to those who tend to hearth and home. WHO indicates that smoke from traditional stoves is a great environmental pollutants and thus implicates exposure to smoke from cook fires and stoves in close to two million premature deaths per year – surpassing deaths associated with tuberculosis and malaria – and cites these cooking methods as the fifth most serious risk factor for illness in the developing world. In addition unsustainable use of biomass as fuel is causing environmental degradation in most developing countries. Foraging for fuel contributes to deforestation, soil erosion, water pollution, loss of soil fertility, and ultimately, desertification. Currently this is great menace for sub-Saharan Africa. It is for this reason that we have a Carbon Zero stove as a candid consideration which relieves hard times for women who tirelessly work in smoky kitchens. In many parts of the country in Kenya we have raised people’s awareness of the importance of having a healthy cook stove in the kitchen hence distributed more than 60,000 energy efficient cook stoves – this has not been an easy task! Our principle motivation and driving force has been the desire to reduce smoke inhalation and related illnesses among African communities, as well as burn related injuries caused by traditional fires. This has given many of our beneficiaries’ peace in their kitchens. With the deep understanding that there are various efforts to combat climate change across the globe we chose to join the efforts and focus at household level where degradation starts from. Through influencing and changing mindsets at household levels through cooking habits and adoption of energy efficient cook stoves then step by step we reach to the community, region, country and the globe at large hence standing out tall and high as ambassadors for climate change! YES; we value the environment and controlling environmental degradation begins from the household level. Many African families rely on women to care for them and to provide basic necessities for survival. As African women receive education and are recognized with a higher legal status, they provide their households with superior nutrition, stronger food security and increased access to health care. Despite the crucial investments women make in their families and the contributions they make to their communities, they still suffer silently in the background. The residents of Wayani, a small village in Maungu location in Taita Taveta County know Phyllis Magana as the go to person for advice on many matters ranging from spirituality to family life to environmental conservation to matters agriculture. Phyllis describes herself first as a mother then a clergy of the Anglican Church of Kenya and an agricultural officer with the Ministry of Agriculture. She admits that it is quite a task balancing all those roles. Up at the crack of dawn, she prepares her family of four for the day, “The woman is the life of a home” she explains as she carries a small pile of firewood from the shed to her kitchen “The woman of the house is the manager of everyone living under her roof.” She continues. Everyone in Phyllis’ household has already left for their daily activities and chores but she insists on making fresh tea for her guest. Her kitchen is warm and homely and soon, a pot of tea is boiling. She explains why she has insisted on making fresh tea; to show off her Carbon Zero energy efficient stove and share why she is so proud of it. “This stove is efficient and saves me time, money and effort.” She further compares it with the paraffin and three stone traditional stoves she used to use earlier before getting an energy efficient stove from Carbon Zero. Firewood is a big problem here. With more families settling in the area plus the clearing of forests for farming sources of firewood are limited and the environment gets overly strained to cater for the communities energy needs. She used to buy firewood as she had no place to fetch enough for her family’s needs with dwindled forests. Also the traditional stove used a lot of firewood and produced a lot of smoke the complete opposite of her CZK stove. When the stoves were being introduced to the village, she immediately saw the advantage and had one built for her family. Not one to benefit alone, she advocated to the village during a chief’s baraza to dispel from them all hesitation and mistrust that comes with the introduction of any new things. The money she used to use in the procurement of firewood and kerosene was channeled to her chicken project which she uses to buy feed for them. The best thing is the smoke free environment her kitchen has become. “No more sore throats and puffed up red eyes from crying from the plumes of smoke produced by firewood,” she says.